Hey guys, so here is what you have all been waiting for, some new Binweevils codes for the month of May 2015. These codes are all new so they should all work when you type them in. Remember, you can only use these codes once per account so don’t try to keep typing in the same code because it won’t work. If you are looking for more Binweevils codes you can always read the latest issue on Binweevils. The first code is FIGG2612. This Binweevils code will give you a whopping 1000 Mulch to spend on any items you want! You have to use this code by May 17th 2015 so hurry. The next code is JUNGLE56. The third Binweevils code we want to share with you is BESTNEST160DOSH. If you type in BESTNEST18DOSH you will get yet another Binweevils code to use. So far this is the list of the new codes that you can use in May 2015. We will add some more to this list as the month continues. We hope you enjoy using these codes as much as we do. So as some of you may know, you can build a Snow Weevil on Binweevils at the Winter Wonderland right now. Building the Snow Weevil isn’t as easy as you may think because you have to look at each piece’s clue and to figure out where it is hidden around the Binscape. 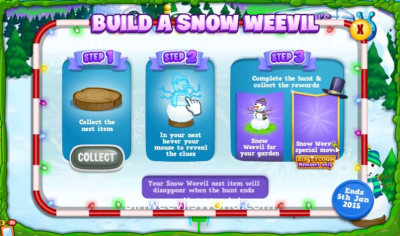 There are a total of ten pieces to collect before you can get the free Snow Weevil garden item and dance move. Lucky for you we already found all the pieces and have revealed their spots to you down below. You can also watch the video we created to find all the pieces as well as this video is a complete Snow Weevil walkthrough. The first piece is in the Club Fling and to get it you have to sit in the DJ box and click on one of the buttons. Then the snow ball will drop and you and click on it. The second piece is in the Shopping Mall on the second floor acting to be part of the Bin Pets Paradise eye. The third piece in the Winter Wonderland on the top right of the playing screen just above the trees. It looks like an SWS badge. The fourth piece is in Tinks Tree but to make it fall you have to climb up the tree and onto the branch to the right of it. The fifth piece is in the Pool hall next to the pool sticks. The sixth piece is found in Dosh’s Palace as two big fish eyes. The seventh piece is is found in the Bin Pet Paradise. The carrot is being held up by a Bin Pet statue in front of this area. The eighth piece is in Tum’s Diner and you can get it by clicking on the ice cream machine. The ninth piece is in the Nest area where you can play with other friends. You should see the scarf on a nest to the left of the playing screen. The tenth item is on the beginning of the path to the Gam Castle. There is a Bin Pet statue wearing a hat. It is December and that means it is one of the best months to play on Binweevils. 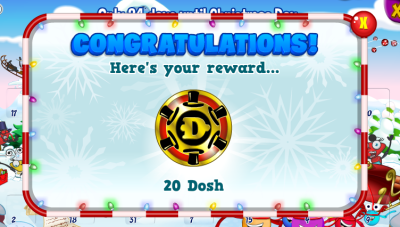 During the month of December Binweevils gets very generous in giving their players Dosh coins. Well, we are going to make sure you know how to get the Binweevils free dosh coins this month so you don’t miss out. To get the free dosh you need to use your Binweevils Advent Calandar. When you open up the calendar you can click on the number that goes along with the date. If you are a Binweevils member you can click on any of the past dates that you have missed; however, if you are not a member than you only get to click on the present dates so if you missed any days you are out of luck. Through out the calendar are free Binweevils Dosh coins that you can get. On the date that we wrote this ( December 1st) we open up the first box and received 20 Dosh coins. Not every day will be free dosh but it may be free Mulch coins, or other free nest items. There are 15 exclusive nest items, 2 exclusive garden items, 100 Dosh coins, 3000 Mulch coins and 300 xp that you can get by opening every box up on the Advent Calendar. 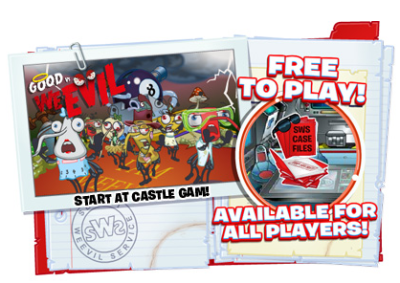 Hey Weevils, there is a new mission that everyone can participate in and its called the Binweevils Good vs WeEvil case file. The best part about this mission is that anyone can play it even if you are not a member. This case is a little different from most and that’s because its close to Halloween! The so called WeEvils are out full force destroying things and Binweevils needs your help. You need to try to stop them before its to late. Do you think you can handle the mission? Head on over to the SWS Head Quarters at Castle Gam to accept the mission if you think you are ready. The Good vs WeEvil case is waiting for you to complete it. Good luck my fellow Weevils. Check out the video of the Binweevils Good vs WeEvil walkthrough mission. This may help you complete the mission a little easier by watching it first.